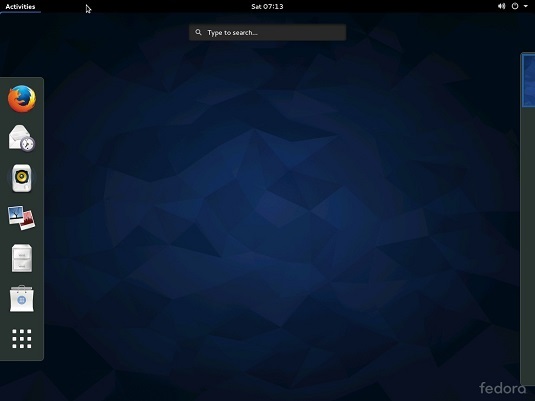 If you plan to use Linux for your networking needs, you will need to be familiar with the GNOME desktop. Although the GNOME desktop looks a lot different from the Windows desktop, many of the basic skills used for working with Microsoft Windows — moving or resizing windows, minimizing or maximizing windows, and using drag-and-drop to move items between windows — are almost exactly the same in GNOME. Activities: The Activities Overview provides a single access point for all GNOME applications. It provides fast access to common functions, such as Internet browsing, email, or file management, as well as desktop access to other applications. You can access Activities Overview by pressing the Windows key on the keyboard or clicking Activities in the top-left corner. Settings: To manage your system or user settings, click your name at the top right of the screen. This reveals a menu with options for various settings.